600mm high Plastic banner roll, in multiple lengths of 100m. Packs of 52 Playing cards with TB related facts & slogans. 3 Dvd, 3 sets of 5 A3 laminated Posters. Topics: Normal, MDR & XDR TB, Colds & Flu, Diet & Lifestyle. Facilitator’s Manual, 4 x Dvds, 1 Flipchart, 12 laminated Posters & 150 Pocket Posters. Topics: Normal, MDR & XDR TB, How you get TB, Symptoms, Risks, Testing, Treatment, Cure. 12 Pocket-sized handouts, topic: Normal, MDR & XDR TB, How you get TB, Symptoms, Risks, Testing, Treatment, Cure. A4 folded Infolets, topics: Normal, MDR & XDR TB, How you get TB, Symptoms, Risks, Testing, Treatment, Cure. 4 Mult-language. Topics: Normal, MDR & XDR TB, Personal & Household Hygiene, Cold & Flu, Diet & Lifestyle. 12 x A3 or A2 laminated Posters. 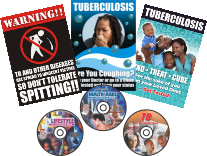 Topics: Normal, MDR & XDR TB, How you get TB, Symptoms, Risks, Testing, Treatment, Cure. A2 12 Poster Flipchart with folding stand. 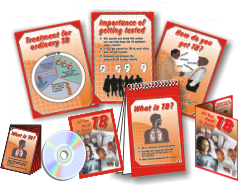 Topics: Normal, MDR & XDR TB, How you get TB, Symptoms, Risks, Testing, Treatment, Cure.